However when we discovered Tobias lives just around the corner from our Cobham HQ, we couldn’t resist asking if it was ok to call in and explore his new garden masterpiece! It makes a perfect playroom for the kids when empty, and sometimes it’s just right for sleepovers. What does Tobias use his log cabin for? How did Tobias buy his log cabin? After an initial search online, he visited our Ripley display site. He saw a cabin very similar to what he had in mind and discussed his plans with Branch Manager, Chris Greenwood. Detailed design plans soon followed, and it was after Tobias mentioned that the cabin would be visible from the rear bedrooms of his house that we suggested adding our optional Western Red Cedar Single tiles. 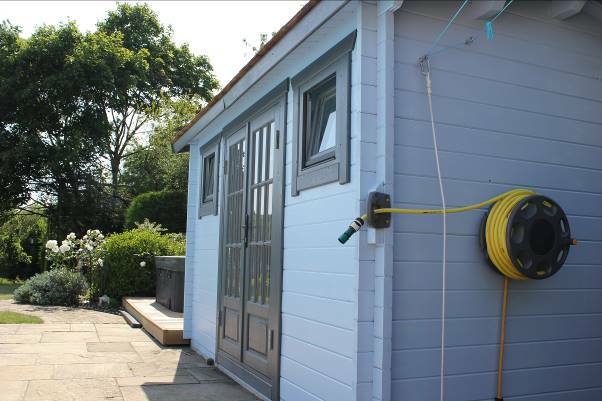 Tobias also really liked the light blue with contrasting windows and doors of one of our display cabins, so this was also added to the order. Easy. A few weeks later and the log cabin was ready to be installed by our own team. On our advice, Tobias had arranged for a concrete base to be built whilst the cabin was being manufactured and all that was left was to agree a date. If you’ve been inspired to investigate by Tobias’ story to invest in a log cabin yourself, why not pop into our branch on Portsmouth Road, Ripley. Our super knowledgeable cabin gurus will give you all the advice you need on the best options, and how to prepare a space for your new pride and joy. Special offer – Spread the cost of a log cabin with 0% finance over 12 months! Spread the cost of your new log cabin over 12 months with our new 0% instant finance offer. Contact us for more information, or just come along to our branch and speak to the team.